The phrase “reinventing the wheel” has long referred to the wasted energy that comes of working on something that’s already been done before and functions just fine as it is. Over the past few years, however, a California-based skateboard and longboard company has been putting that notion to the test. The results? They have quite literally reinvented the wheel. Launched in 2012, Shark Wheel provides an innovative alternative to standard rounded wheels. Inventor David Patrick incorporated the physics of a sine wave to create a hybrid sphere and cube wheel that reduces friction, allowing it to pick much more speed and absorb less wear and tear. “We came up with a wheel that doesn’t rock stop. There isn’t a steamroller effect. No matter where the rock hits on, the next part of the surface is trying to get out of the way,” said Patrick in an Orange County Register interview. Unlike standard rounded wheels that touches the entire flat surface it’s on, the unique Shark Wheel shape gives it the ability to ride smoothly over uneven surfaces and with more control through water much like antilock brakes on a car. 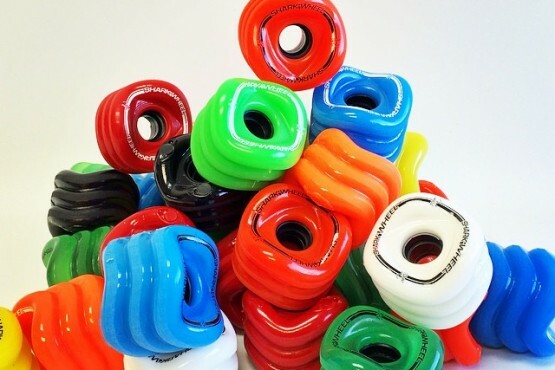 Excitement and momentum continue to grow for Shark Wheel among its target demographic of skateboard and longboard riders, but the possibilities are certainly endless. Virtually anything with wheels could be getting an upgrade soon. So what do you think? Are Shark Wheels the next big thing? Vote and share your thoughts in the comments!